Within the Spinning and indoor cycling community there has been a lot of anticipation surrounding the launch of this new bike for Summer 2014. This Spinner NXT Black Belt marks the release of Star Trac and Madd Dog Athletics' first belt driven Spinner bike. 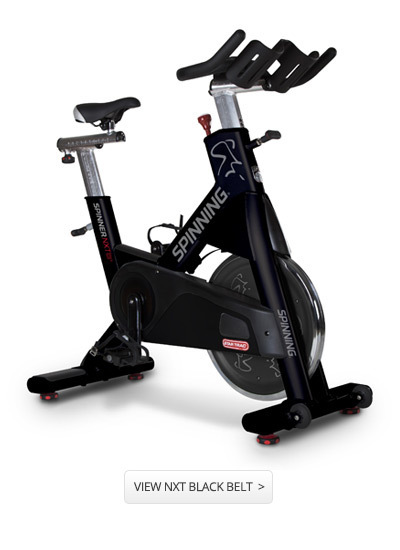 Spinning, as the most comprehensive and established brand of indoor cycling machine on the market, have seized the opportunity to expand the range to incorporate their first bike for those who prefer to use belt driven technology. The aim of the new technology is to make machines which ride quieter, smoother and realistically. Combined with the award winning features of the NXT, the Black Belt employs a Poly-V belt in conjunction with the Star Trac patent pending drive train and pedal system which exceeds the industry standards for group cycles. The Black Belt will retail at £1299.00 and is available now from Origin Fitness. This entry was posted in Just Launched on 4th June, 2014 by Craig Fleming.